Chief Executive Officer, Charter School Properties, Inc.
Joe Rauenhorst is CEO of Charter School Properties, Inc. in Boca Raton, Fla. 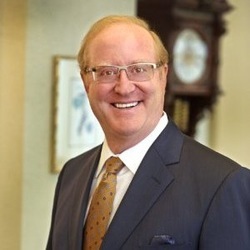 He is the past president and chief executive officer of Opus South Corporation, where he managed all real estate development, design and construction operations of six offices throughout the Southeast. Rauenhorst began his career as a trial attorney and became a partner in the law firm of Burditt, Bowles & Radizius in San Francisco. He joined the Opus Group in 1989 in the general counsel’s office in Minneapolis, and then served as general counsel of Opus Investments before moving into management at Opus North, where he ultimately became president. In 1995, Rauenhorst started Opus East in Washington, D.C., and then moved to Boca Raton, in 2002 to take over operations of Opus South. Rauenhorst serves as chair of the board of directors of the Rauenhorst family office, Adler Management, LLC, and the Opus Prize Foundation board. He also serves on the board of directors of Cristo Rey Network, Green Cay Asset Management and The Joseph Rauenhorst Family Fund. Rauenhorst earned a juris doctorate at the University of San Francisco and a bachelor’s degree from Marquette University. He is a member of the Young Presidents’ Organization, Urban Land Institute, National Association of Industrial and Office Properties, Marquette University 1881 Society, and the State Bars of California and Minnesota.